Eaton’s Ground Fault Monitoring Relays are designed for industrial applications and have passed rigorous noise immunity, vibration and shock tests. 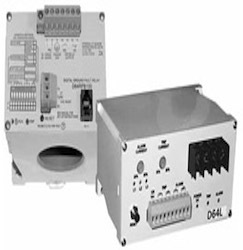 They provide system security and immediate reliable low level ground fault detection on three-phase AC resistance grounded or solidly grounded electrical distribution systems. Ground Fault Monitoring Relays are capable of monitoring ungrounded supplies power systems up to 600V, for maximum equipment protection. Alarm or trip provides detection if an insulation fault develops anywhere on the system between the source and the load. Rugged ABS housing and all potted construction provides durability and ensure a long life. Maximum system security and immediate ground fault detection helps avoids nuisance tripping due to charging currents. User is able to set the ground fault trip current of the relay just milliamps above the highest level, to accurately measure the system charging.